Welcome to the ERI January Newsletter. After a quiet couple of weeks, including a short break over the Christmas and New Year period, January is proving to be a busy month. Brian was invited to participate in the multi-discilplinary group of experts meeting of the Forum of Catholic-inspired NGOs in Rome early in the month. Team members attended an inter-sessional meeting of the Human Rights Council on Jan 16th which explored the links between human rights and the 2030 agenda. (see story opposite) . January will conclude with the presentation of an abbreviated version of the ERI course in Human Rights and Advocacy which will be attended by members of leadership teams of the Christian Brothers and Presentation Brothers, together with two Presentation Sisters, The Honduras co-ordinator from Trocaire, Ireland, and two members of the Caplor Horizons team, based in the UK. From just before Christmas until early January, Tino spent time in India to address some legal issues following the recent death of his father, during which time he attended the Brothers' assembly in Mumbai. Upon his return he worked on preparations for the annual audit. At the end of the month, after finalising the annual report, Brian departs for several weeks home leave in Australia. In Geneva: Brian Bond cfc, Tino D'Abreu cfc, Bernard Gazire fpm and Kevin Mullan cfc. Submissions are due 6 months prior to the date of the review. In addition, over the next year several countries of interest are due to report to committees overseeing the various UN Conventions - Treaty Bodies. Procedures for the reviews vary with different committees. Most committees conduct a review of a state over several sessions. The Committee on the Rights of the Child conducts separate reviews on each of the Optional Protocols (if ratified by the State under review) in addition to the core treaty. Edmund Rice International is again urging support for the Children's letter-writing campaign on behalf of children with HIV/AIDS. 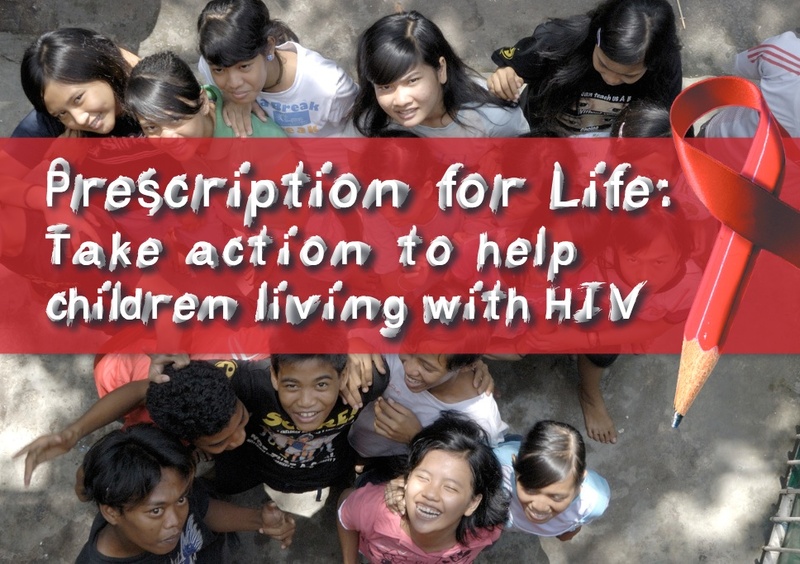 The campaign targets governments, pharmaceutical and diagnostic companies, and media in order to improve access to age-appropriate HIV information, testing and treatment for children and adolescents living with HIV. Children and young people are invited to take action with their school, faith community or family to help make this happen. Resource materials have been updated by the Ecumenical Advocacy Alliance and are available here. Our hope is that schools who supported the campaign in the past will do so again with a new group of students, and that they will be joined by many more of the estimated quarter of a million students in Edmund Rice schools around the world. Governments are being asked to do more to eliminate mother to child transmission of the virus, do more to ensure children living with HIV receive appropriate treatment, care and support, to strengthen the capacity of families and the community-level and social welfare child care workforce so that together they can meet the developmental needs of children living with HIV, and address the problem of stigma and discrimination associated with the infection. The International Covenant on Civil and Political Rights (1966) has been ratified by 169 UN member states, including all countries where the Edmund Rice Network has a presence. Compliance with the treaty is monitored by the Human Rights Committee which meets in Geneva. The Convention has two additional Optional Protocols which must be ratified separately. The first Optional Protocol relates to the establishment of an individual complaints procedure and has been ratified by 116 UN member states. Fourteen states in which the Edmund Rice Network has a presence have not ratified the Optional Protocol, (Dominica, Grenada, India, Kenya, Nigeria, Papua New Guinea, St Lucia, South Sudan, Timor Leste, Trinidad & Tobago, Tanzania, UK, USA and Zimbabwe). Liberia has signed the Convention but not ratified it. The second Optional Protocol to the Convention relates to the abolition of the death penalty which 85 UN member states have ratified. Sixteen states in which the Edmund Rice Network has a presence have not ratified the Second Optional Protocol. (Dominica, Grenada, Ghana, India, Kenya, Nigeria, Papua New Guinea, Peru, St Lucia, Sierra Leone, South Sudan, Trinidad & Tobago, Tanzania, USA, Zambia and Zimbabwe). (The signing of a treaty is a means of authentication and expresses the willingness of the signatory state to continue the treaty-making process. The signature qualifies the signatory state to proceed to ratification, acceptance or approval. It also creates an obligation to refrain, in good faith, from acts that would defeat the object and the purpose of the treaty. 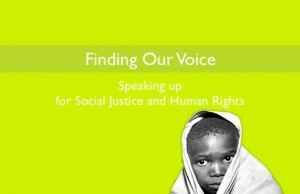 Like to learn more about how you can take effective action for justice at a global level? Want to know more about the work of Edmund Rice International (ERI) and how you can be part of it? Then why not sign up here for the ERI online course which aims to raise awareness about more effective global action for justice. The next 2-week training course in human rights and advocacy will be offered in Geneva from April 29 - May 10, 2019. Applications will need to be made by Wed Jan 30th to ensure all successful applicants have sufficient time to apply for a visa. 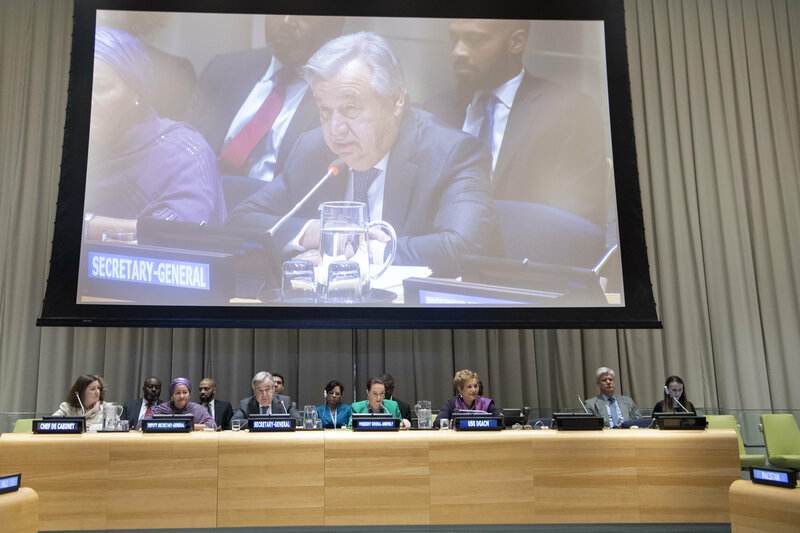 In his New Year message delivered at UN headquarters in New York, Secretary General Antonio Guterres reflected on progress made in 2018 and outlined five priorities for 2019. Among the successes for 2018 he listed progress towards achieving peace in several of the world’s trouble spots such as Yemen and between former enemies Ethiopia and Eritrea. He also cited progress on the implementation of the Paris Agreement made at the meeting in Poland in December, the adoption of global compacts on migration and refugees, renewed engagement for peacekeeping operations (currently there are fourteen such operations) and steps to reform the UN. The priorities listed for 2019 were:- Diplomacy for peace - “As we strive to end conflicts around the world, we understand that lasting peace must be based on a broad consensus of society, with women as full participants in all peace processes,” the UN chief said. Ambitious climate action - “There is no greater challenge to the world of today and tomorrow” than climate change” Mr Guterres stated, and he indicated his intention to convene a Climate Summit in September to mobilise action by political leaders, the business community and civil society in order to progress the goal of net zero global emissions by 2050. Acceleration towards the Sustainable Development Goals (SDGs)- “Despite considerable efforts from Governments and many others, the transformative changes demanded by the 2030 Agenda are not yet being made,” he said. Better governance over new technologies - while acknowledging the contribution of new technologies to peace and sustainable development, he also noted that they “are also outpacing our capacity to reckon with their profound impacts”. A special meeting of the UN Human Rights Council on Human Rights and the 2030 Agenda for Sustainable Development took place in Geneva on Jan 16th. The meeting aimed to highlight good practices, achievements, challenges and lessons learned in the promotion and protection of human rights and the implementation of the 2030 Agenda for Sustainable Development. A range of speakers and panelists took part. Michelle Bachelet, UN High Commissioner for Human Rights,noted that whilst progress was being made in areas such as in reducing the number of people living in extreme poverty, improved participation rates in education and reductions in maternal and child mortality, issues such as gender equity, forced displacement of populations, climate change, hunger and malnutrition, youth employment, air pollution and growing inequality remained major challenges which threatened the realisation of the Sustainable Development Goals (SDGs). Mary Robinson, Chair of the Elders and the President of the Mary Robinson Foundation - Climate Justice spoke of the need to speak out forcefully about the urgency of action to address climate change, especially in the light of the recent IPCC report. She highlighted a major weakness of the 2030 agenda which was the lack of accountability of states regarding implementation. She also made reference to rising inequality and concentration of wealth and the rising threat of nationalism which undermined the global partnership necessary to achieve reach the SDG targets. Whilst supporting calls for greater contributions from countries of the developed world, she also stressed the importance of eliminating corruption and of ensuring good governance among developing nations. 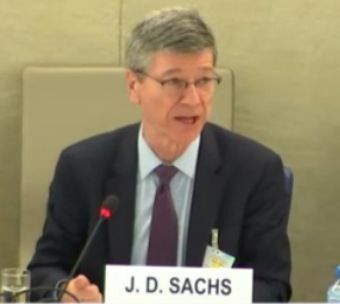 Professor Jeffrey Sachs, the Director of the Center for Sustainable Development at Columbia University delivered a blunt warning. Unless there is effective action taken to provide the necessary finance at the meeting of the High Level Political Forum due to take place in July 2019, the SDGs will fail. He noted that whilst the world is rich, millions are denied their basic human rights to an adequate standard of living,to health, to education etc, due to the failure of governments and super-rich individuals to fulfill their responsibilities. He cited the example of the US which gives 0.17% of GDP as foreign aid instead of the 0.7% first agreed by states in 1970, and repeatedly re-endorsed at the highest level at international aid and development conferences. He pointed to the scandal of the rich continuing to live with impunity, with 10 individuals having a combined wealth $720 billion, with the wealth of billionaires increasing 7 times since 2000 and with the number of billionaires increasing 5 times in past 20 years. Citing SDG 17 he urged taxation reform and action to eliminate tax evasion as a means of raising the relatively small amounts of money needed to address the SDGs. A webcast of some proceedings can be viewed here. The 2018 progress report in the implementation of selected SDGs can be viewed here. New Zealand and Uruguay were among the fourteen countries reviewed during the 32nd session of the Universal Periodic Review in Geneva in January. Addressing discrimination against the indigenous Maori population was a major focus of the recommendations made to New Zealand, along with family violence and the emotional and sexual violence directed towards women. The level of child poverty was also a concern with some estimates suggesting more than 200,000 children were living in poverty or experiencing economic hardship. 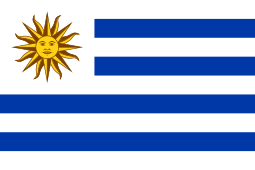 The major issues on which recommendations were made to Uruguay included prison conditions and reform of the penal system, domestic violence, particularly violence against women, human trafficking, poverty, the drop-out rate from the education system and the marginalisation and discrimination experienced by persons with disabilities, members of the indigenous population and persons of African descent. ERI was pleased to note that the issues raised in its joint submission with FMSI (Marists) were included in the recommendations made. These recommendations related to the incarceration of minors and their treatment within the penal system, school retention rates, particularly among vulnerable groups in the population, and violence against children and adolescents. Uruguay will decide in the coming weeks which of the recommendations it received will be accepted and implemented, after which the advocacy focus of our network will be on monitoring progress of the implementation and encouraging the government of Uruguay to honour the commitments it has made. "Following an early morning flight, and after checking in to our hotel, we proceeded to walk to the ERI offices. Greeted warmly by the ERI team, Br Brian Bond then explained to us the UPR system and the history and extent of the ERI’s presence in of the UN as an NGO. Here, amidst the much higher room temperature, our multitude of layers to protect against the cold outside made his focus on the uncomfortable reality of Global Warming seem particularly fitting. It was certainly interesting to be made aware of the depth of research undertaken to aid the pursuit of a healthier, more stable world, not only on a moral and personal level, but firmly supported by scientific effort, and even more remarkable to be reminded of the direct opposition to human justice that many individuals choose to embrace, alienating the sufferings of those in most need of help. 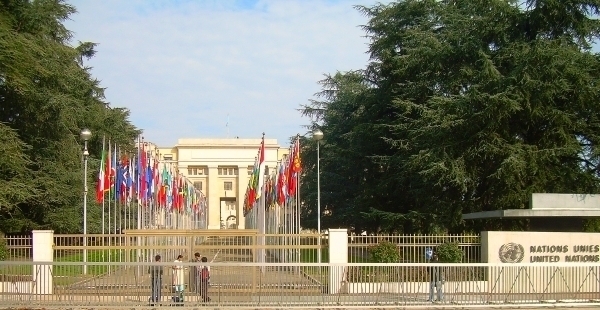 Around midday we took our passes from the UN buildings, before having lunch in the Palais des Nations. 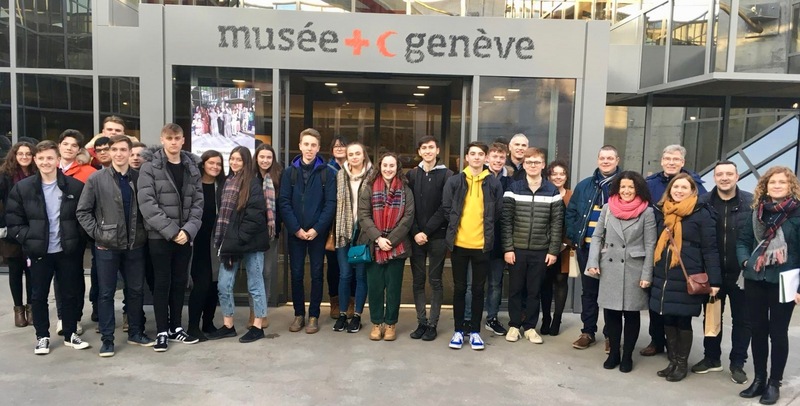 A tour of the old and new buildings followed which revealed magnificent structures and provided insight into the history of the UN, and the League of Nations. The following day we returned to the UN to witness the UPR review of Chile. (Due to the size of the group the Irish participants attended the review of Uruguay on the following day). Chile’s extensive exchange with the other member states was interesting in its delivery and rigour. It became evident to me that all members of the panel had to be present because they wanted to uphold the values and rights entitled to all individuals, and that without such empathy and concern for others the system would be rendered ineffective. Our visit to the Red Cross Museum which followed, was striking and underlined the importance of organisations that strive to preserve justice in the world and help those suffering in situations ranging from the victims of natural disasters to those unfairly imprisoned by their governments. The displays of the museum provided a poignant reminder that suffering is ever-present around us and that the world of my daily life is deaf to the cries of victims—a reminder that the need for help and the significance of justice does not stop with one act of aid but must continue to prevail in all different countries against the variety of injustices. Our stay lasted only two days, but this brief period was enough to immerse our thoughts in a flood of realisations regarding the situations of people who have been stripped of their human rights. We are extremely grateful to the ERI team for providing us with such an opportunity, inspiring in us an awareness of the importance of the values of love and respect in pursuit of peace and the need to continue to advocate for human rights in our community." The Sustainable Development Goals (SDG) are a universal call to action to end poverty, protect the planet and ensure that all people enjoy peace and prosperity. Each goal has a set of targets to be met by the year 2030. 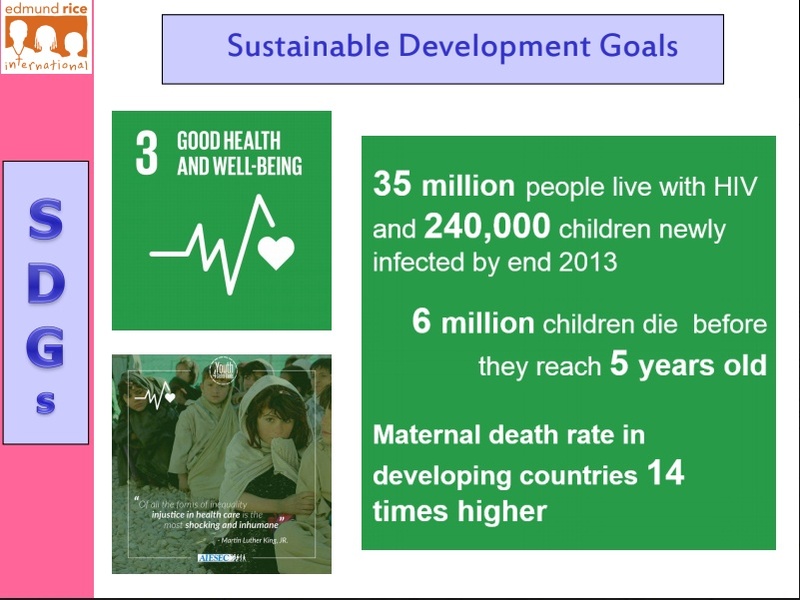 Click on the image below to learn more about SDG No.3 - Good health and Well-Being and the targets to be met by 2030. Hello, you are receiving this email newsletter because you expressed a wish to receive it. Copyright (C) 2019 Edmund Rice International All rights reserved.